Ask fellow campers about "Angler's RV Retreat" and nearby attractions. 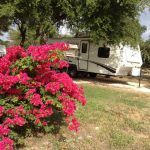 Small RV park in Rockport 5 minutes drive to the town and its park/beach/restaurants and shops. Some damage to trees due to Hurricane Harvey. Sites are maintained gravel that are level with pavestone type patios. Full Hookups and cable. The sites were plenty long enough for our 35' rig. The campground owners were very nice and accommodating. They gave us a $50 discount off the normal $150 weekly rate because we were in town volunteering our time to help with Hurricane relief. The campground was full. Usually, the campground is full with longer-term people. No campfires are allowed. We camped at Angler's RV Retreat in a Fifth Wheel. In Fulton - Charlotte Plummers and Moon Dog restaurants. In Rockport - The city park and beach - once it is cleaned up from the Hurricane. Tackletown for fishermen. Thank you for the awesome review and most of all thank you tremendously for coming to Rockport and helping the community clean up. Hurricane Harvey hit the Texas coastline hard and it is a huge shock to come home to deal with destruction of not only our home and property but to see my friends homes and community property destroyed. People such as yourselves brought all of Rockport HOPE and inspiration that our so called media is busy trying to say doesnt exist. Thank you!!!! Give us a call when you are coming down for some R&R. My goodness! What a very friendly and accommodating place! We were last minute to reserve a place and ended up arriving 2 hours past the time we expected. It was dark and around 10:00 but the owners were right there with their friendly faces and flashlights to help us back in. Then they and a couple camping there visited with us and helped answer any questions about the area-- We had a classic/vintage/restored camper and they were all very interested in it. We had a great time visiting and they were all super helpful. This is a very nice place, and not too large to have lost the personal touch! We will definitely return. We camped at Angler's RV Retreat in a Travel Trailer. It was really nice to be greeted by the owners as soon as we arrived. They helped us back the trailer in and get set up. They also gave us good directions to grocery store and Wal mart. 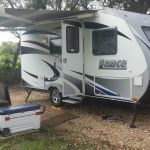 Any time we had issues with our trailer they were more than ready and available to get things fixed up for us or at least direct us to the proper place. All the other campers were very nice to us as well. It is nice to see a campground with lots trees and flowers all over. We will definitely coming back here and would highly recommend this campground. We camped at Angler's RV Retreat in a Travel Trailer. The HEB grocery store and Wal mart are both very close with a huge selection of foods. Downtown is about 5 minutes away and about 15 minute drive to the Gulf of Mexico. Lots of piers and places to go fishing and fresh seafood stores selling fresh fish, oysters and shrimps. It is a nice, pet friendly, charming park. It's off the main drag from the water and shops; however, the short distance (est. 1 mile) provides a nice quite place to stay and enjoy nature. Many birds make this place home and we enjoyed the peace and quite. The owners keep the park very clean and well maintained. Make reservation early as it is a small rv park. The trees are very nice and provide shade. It is a very pet friendly park. Good Times.We highly recommend this place if you plan on going to Rockport, Texas. We camped at Angler's RV Retreat in a Travel Trailer. Small park does not have bathrooms, rec hall or planned activities. Quiet with good electricity and WiFi, cable TV, roomy sites and friendly helpful owners on location. Sites and roads are gravel. Cement patios and nice picnic tables at each site. City water for rig use but each site has available outlet for well water to wash vehicles. Everyone lets their dogs run loose including owners. Nothing fancy but clean and we would return again We camped at Angler's RV Retreat in a Fifth Wheel. The owners and other campers were very nice and friendly. It is close to shopping, a Walmart, large grocery store, and very central to area attractions, beach, fishing, etc. They have a camp fire on Friday and Saturday nights so everyone can get together and socialize. One of the best campgrounds we've been in. Owners went out of their way to help us with any of our requests. You won't be disappointed camping here. We will be definitely going back. We camped at Angler's RV Retreat in a Travel Trailer. No facilities for kids, laundry,rec hall, restrooms or showers. This is for self contained units only. The pads are dirt/rock and well done. The family that owns the campground is very friendly and peaceful. It is close to shopping, restaurants and fishing. Yes we will return again. We camped at Angler's RV Retreat in a Motorhome. I wanted to do an edit of my previous review but they don't have that option on this site. I have now been here for seven weeks and went ahead and changed the rating to a 10 because even without the laundry - it's a 10! We can ride bikes all over because we are so close to everything. There is a park less than a mile away. Downtown is less than a mile. The fishing is less than a mile. You can ride your bike to Wal-Mart, Post Office, HEB, Burger King, The Diner (restaurant), JJ's (an even better restaurant) and many other places. The laundry is less than two miles away and has plenty of washers and dryers. The owners have two great children and are the best hosts. The monthly rate is $175 and that is what I based the nightly fee on. Electric is $0.14 KWH. But, if you want to come here now, you're out of luck. All nine spots are filled. Would highly recommend this place. We camped at Angler's RV Retreat in a Motorhome. This is an extremely small campground. It is family owned and they live on premises. Very quiet and very friendly. Close to everything in town. The only reason I am giving this a 9 is because there is no laundry. There's also no community room or pool, but I don't need those things any way. We are staying until March 2011 and think we will really like it here. Weekly rate is $125 (plus electric), monthly rate is $175 (plus electric). We camped at Angler's RV Retreat in a Travel Trailer. Are you affiliated with Angler's RV Retreat ?